Scapegoatism and the Normalization of Islamophobia in the U.S.
With Arsalan Iftikhar, international human rights lawyer, and global media commentator. Arsalan is the founder of TheMuslimGuy.com and he also serves as senior editor for The Islamic Monthly magazine. 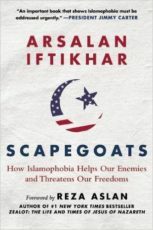 He is author of the book SCAPEGOATS: How Islamophobia Helps Our Enemies & Threatens Our Freedoms. When a murderous psychopath goes on a killing spree, law enforcement officials and the media never make his religion the central issue—unless he happens to be a Muslim. Then it sets off another frenzied wave of commentary about the inherent evils that lurk within the Muslim faith. From Fox News talking heads, who regularly smear Muslim leaders as secret terrorists, to Bill Maher, who has made Islam a routine target, it has become widely acceptable to libel a religion with a following of over 1.5 billion people—nearly one-quarter of the world’s population. Now popular commentator Arsalan Iftikhar—better known as “The Muslim Guy”—offers a spirited defense of his faith that is certain to win him wide acclaim—and yes, another round of overheated scolding from the usual media quarters. Iftikhar’s spirited defense of his faith is certain to hit a chord during the 2016 campaign season, as politicians and pundits vie to be the toughest on the block when it comes to escalating the hostilities in the Middle East, often demonizing Islam in the process. With his witty and levelheaded demeanor, the author will cut through all the sound and fury as a voice of sanity and reason.